It was a *very* full day outdoors! We started with Ranger Carrie giving us an overview of the park and its history--and fielding many questions about how likely the boys were to be eaten by bears--before we hit the trail. ...an hour and a half later, we found ourselves at Cunningham Falls! In the afternoon, we stopped by a local Wildlife Preserve, to get up close & personal with Bengal tigers, white wolves, and the occasional alpaca. 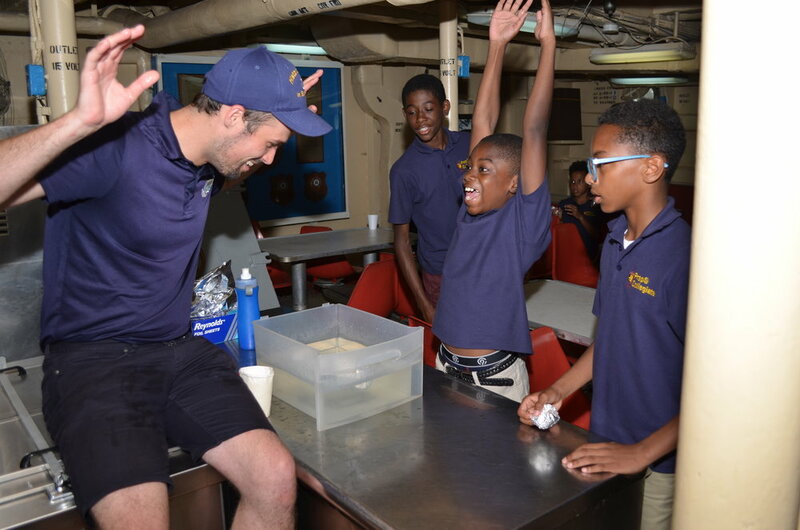 One of the highlights of this final week was a visit to the SciTech lab at the harbor, where the boys conducted experiments to learn more about climate change--they had the opportunity to design their own experiments, exploring how temperature affects ocean water's ability to retain carbon dioxide and explore the role of CO2 as a greenhouse gas. Also: they got to wear labcoats. Ever the bittersweet moment, our summer drew to a close on Friday, August 3rd. The boys processed into Knott Science Center, where they shared some of fruits of their summer labors; we were also treated to some words of wisdom from Calvin Wise--Johns Hopkins University's Director of Recruitment for Undergraduate Admissions--before the boys received they certificates. Finally--of course--we ate. And ate. And ate. What remains to be said? 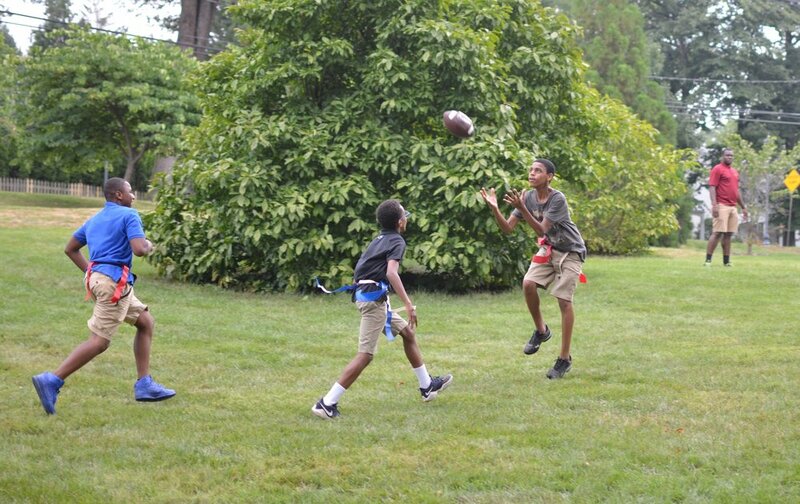 The boys' extraordinary efforts this summer--in the classrooms; during film residency and 3D printing; on the playing field; and on our epic field trips--speak for themselves. 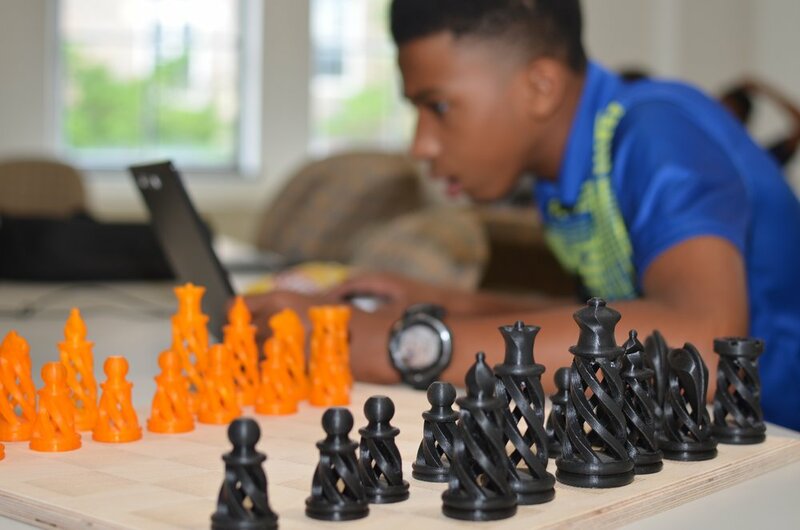 This year brought a 50% increase in the number of students who spent their summer learning, playing, and growing with Prep@Collegiate. We couldn't be more proud of them--or more proud to have the opportunity to work with them--and we're already making plans for an even bigger and better summer in 2019. Another week has come and gone! 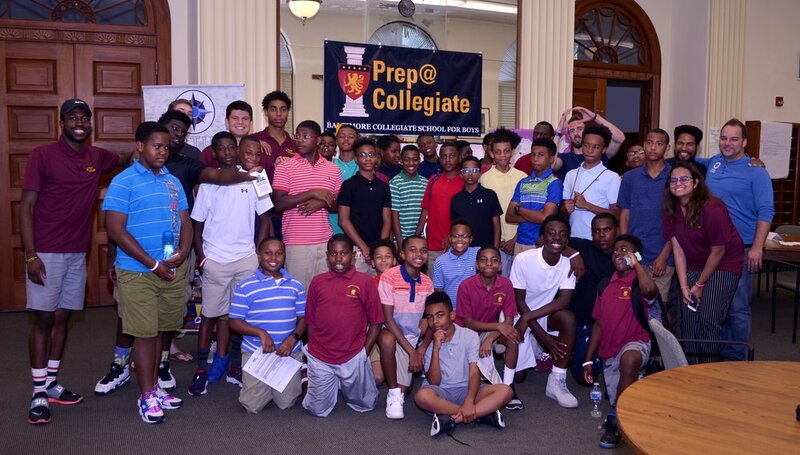 This one started with a Prep@Collegiate first: a full-day, competitive team-based project, designed to teach the boys about the path to college! After that: three more mornings of hard-charging in the classroom; three more afternoons of awesome activities; and one field trip... with a surprise twist! 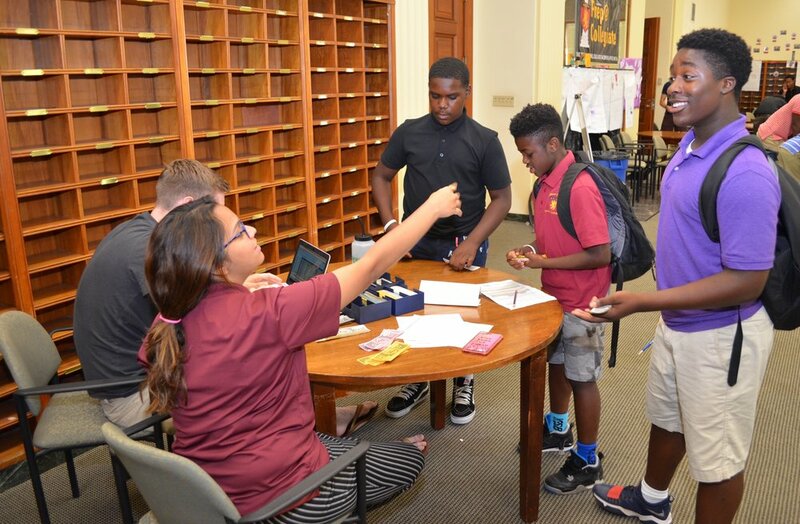 The boys’ day began with a mission: working in their Crews, they were to assume the role of a (simulated) non-profit organization tasked with improving access to competitive high schools and institutions of higher education. They started off with a kind of map-making exercise: surveying the landscape of ‘unknown unknowns’, to get a sense of the kinds of questions they’d have to ask going forward—topics like financial aid, admissions, graduation rates, athletics, and student life. They spent the day doing research; at the end of the day, they presented their findings to a panel of judges, who rated them based on the content and form of their presentations. They were a little rough around the edges, but it was great practice for their upcoming Student-Led Conferences! The other key takeaway was the follow-up: each student worked on an individual College Action Access Plan—taking the questions they’d mapped earlier in the day, and applying them to their own intended trajectories. They worked together with their families to fill in the details... and take one step further down the path toward the future they deserve. 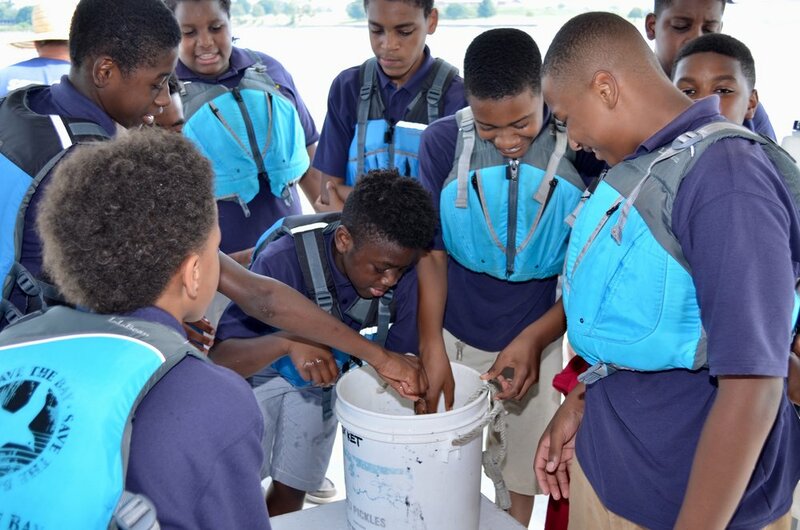 Our plan for this week’s outing was a trip to Annapolis, to the Chesapeake Bay Foundation’s environmental education center. Unfortunately, the near-Biblical deluge this week left the good folks of CBF up to their ankles (literally) in water. The team put their heads together, and came up with an on-the-fly alternative: we turned the bus to the right, and wound up in Washington, DC. In the morning, we went to the International Spy Museum... most of which time the boys spent trying to out-James-Bond each other by seeing who could hang on for the longest time (unfortunately, the ‘No Flash Photography' rule in there means you’ll have to imagine all of it). ...keep an eye out for the next round of guest posts from Team Members as we head into our final week—and have a great weekend! As a member of the Prep@Collegiate founding team, I had no other plan than to return to Prep this summer before embarking on a new career in Education. This Fall, I will be joining the BCSB team as a Collegiate Teaching Fellow. I’m extremely excited to begin working with all the boys, families, and the staff there. In May, I graduated from Frostburg State University with a Bachelor’s of Science in Sociology and Leadership Studies. I was involved in several different leadership positions at FSU that have prepared me for life after college. During my sophomore year I served as a Rising Star in the EchoStars program where I completed 300 service learning hours with Americorps. I volunteered with organizations like the YMCA, the Salvation Army, Special Olympics, and the Cumberland Animal Shelter to name a few. I also served as both a Team Leader and Vice President of SafeRide, a shuttle service that runs from 10pm-2am on Thursday, Friday, and Saturday nights, during my junior and senior years. I spent most of my time working in the Student Activities Office with the University Programming Council, our student run activities board. I held several positions including, Assessments Chair, Business Operations Chair, and President for the 2017-2018 academic year. With these positions I was able to put my studies to practice, enhance my leadership skills and build long lasting relationships in the Frostburg community and beyond. During my senior year I was accepted as a member of the President’s Leadership Circle (PLC). PLC is a distinguished group of 12 senior leaders on Frostburg State’s campus. It’s a unique experience where we have the opportunity to meet with the President of FSU regularly to learn from his experiences and wisdom. We also are involved in other small projects throughout the year and a cross-cultural trip. This year, myself and five of my peers spent two weeks in Uganda over Spring Break. We ate the food, experienced the culture, learned the language (a little), saw elephants, lions, giraffes and so much more. Most importantly, we came to serve and to teach. We spent the majority of our time in the Pakwach District at Kinju Primary School. In this village, families live in huts made of dirt and clay with straw roofs. There’s no running water, plumbing, or electricity. They walk miles to the Nile River to get their water which they use for eating, drinking, and bathing. It’s a very poor community. At Kinju, there are 1007 students. There’s a total of 9 teachers including the headmaster to serve all these students. School supplies are limited, there are only 140 desks so most students sit and do their work on the ground. There are 304 students in P1 or kindergarden and 44 students in P7 or 6th grade. The dropout rate is high, as a lot of girls get married young and boys leave to go work for their families. Despite these conditions, the kids are full of joy and excited to come learn. Most of the students walk miles just to get to school in the morning, walk home for lunch and return for the remainder of the day. We built two structures there and taught the community safe water sanitation and hygiene practices, we also taught the SODIS method, which is solar water disinfection. With the help of some members of the community we built a water tank next to the school to collect rainwater, to reduce trips to the Nile. We also built a latrine in the village and encouraged them to continue to build them wherever they build a home. This entire trip was a very humbling experience, it also taught me a lot about myself and educational inequality. Bringing this back to BCSB, there’s definitely some inequality there as well. But the gap between them and the students in Uganda is much larger. They don’t have chromebooks or access to libraries and the internet in Uganda. However, we still have to attack the gap here in Baltimore and that’s what we’re attempting to do at Prep@Collegiate and will continue to do throughout the school year. There’s a quote by Frederick Douglass that says “It is easier to build strong children than to repair broken men.” Building strong children isn’t just about educating them on Math and ELA but also their emotional intelligence, teaching them how to use their strengths and weaknesses to their benefit, and showing them how to succeed in a country where the black man is seen as dangerous. I have goals of becoming a school counselor and eventually opening up a school in my Mother’s memory, who’s actions shaped me to be the person I am today. As I go on this journey, I ask for your support and I will do my best to serve the BSCB community as a whole. We're halfway through our summer together--unbelievable! The boys are working hard in the classroom, and covering a great deal of ground... in this post, though, the focus is on some of the fun we had this week! The highlight reel includes our second field trip, and an afternoon of Adventures in Financial Literacy (no, seriously--the boys had a blast!). On Thursday afternoon, the awesome team from Ortus Academy brought their roadshow to us: for the full afternoon, the boys ran themselves ragged trying to earn the most (play) money & manage it well... and then, in the postgame session, they came to realize how much they knew--and how much more they didn't know--about personal finances. They. Had. A. Blast. ...coming up next week: Monday brings Prep@Collegiate's first Expedition. Stay tuned! Prep@Collegiate Summer Academy was the perfect opportunity for me to get a better grasp of gamifying lessons and content in the math classrooms by using two distinct strategies and methods and marrying them as one: Class Craft and Judo Math. Because Middle school lends itself to this model, we have successfully done this in two ways: character training and personalized learning goals. In the beginning, students were given avatars through Class Craft and online gamification program that allows teachers to award experience points and powers for great behavior and action while taking away health points and assigning consequences for inappropriate behaviors. Their life has become the video game and everything they do impacts their virtual character as well as their real-life character. FortNite the game has made this the perfect time to implement because kids live, sleep, and breathe virtual reality. It is such an awesome opportunity to use that world to help keep track of the real long-lasting behaviors that determine future success. In addition, the Judo Math system has been incorporated in the Class Craft world through the Quest option. Judo Math separates the curriculum into a set of achievable learning targets and objectives grouped by color or belts. Each belt may have 2-6 objectives so that when the student masters them all, they move on to the successive belt until they reach black belt or green belt. Each belt group comes with a bracelet; the goal is to get all 5 by the end of the unit. I have found that it is better for students to see their progression sooner than later, therefore stretching all 5 belts over the school year is not advisable. It is best to reset belts at the end of a quarter or semester. 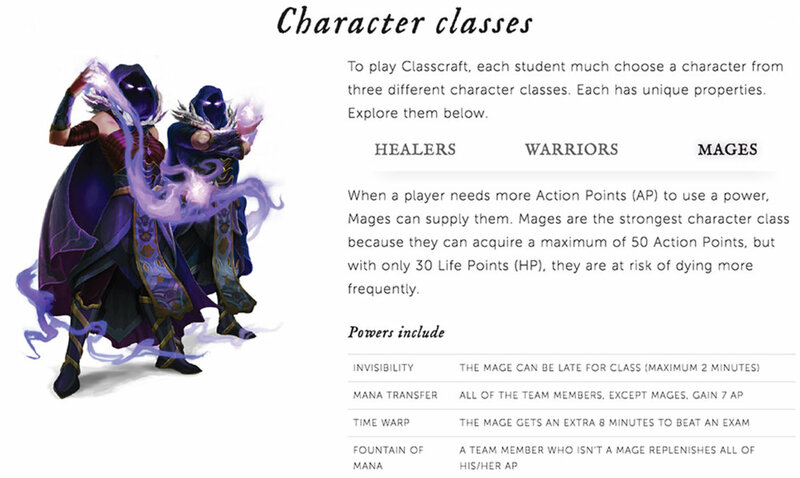 Within Classcraft, the teacher has the option to set a Quest in a make-believe world where the first task is a video with an embedded quiz or assessment – Edpuzzle or LearnZillion is best for this. If students show that they understand they can go to the next town or mission; if not, they can go in a different direction to help reinforcement the correct learning and then catch up with those who got it the first time in the next mission. The same goes for practice or independent work when assigned. Teachers can grade work or assign it so it is graded digitally. Then send students with mastery in one direction to complete a project or final culminating event while students without mastery travel in another direction to practice more. Finally, they then connect with the final event (assessment). The good thing is students only see their path and what they have unlocked, they do not know about the other worlds until they unlock it with mastery, so everyone’s path is different. I like to use the 5E approach to learning which exposes students to the new material by making connections to what they already know. Then students learn by engaging in an interactive task or video. Afterwards they explain their understanding by submitting notes or reflection. Next, they practice until they are ready to assess. Each Learning target is given to students in advance and they take the time they need to master and move on. Each quest is different and unique to the student himself. For every progression they gain points and powers they can use in the classroom. Who said learning couldn’t be fun!? Ms. Forsythe flying high with the boys at Outward Bound! Good morning to all the families at Prep@Collegiate! My name is Luke Mallette, and for those of you who do not know or haven’t met me yet, I am one of the summer fellows this year at Prep@Collegiate. I am the leader of the Amherst Crew, and an assistant to Mr. Amin in the mathematics classroom. 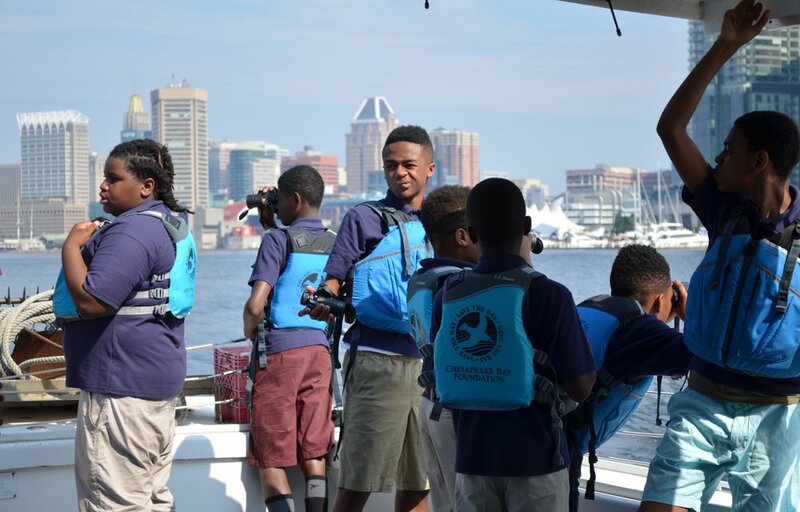 Some of your boys may already know me from the end of the year where I assisted with the 7th grade Northbay trip, and I have spent the previous month working alongside the operations team at Baltimore Collegiate School for Boys. I was born and grew up in Chicago, Illinois, and attended Whitney M Young Magnet High School where I received an offer to play college lacrosse at the next level. I am now a rising junior at Amherst College, where I am majoring in Economics, and a two-year contributing member of the lacrosse team as a Long Stick Midfielder. This upcoming year, I will also be trying out for and playing football at Amherst at the Wide Receiver position, as I am now confident enough in my time management to attempt being a two-sport athlete at a highly competitive university. In my free time (wherever I can find some), I enjoy working out, drawing, chess, and photography. 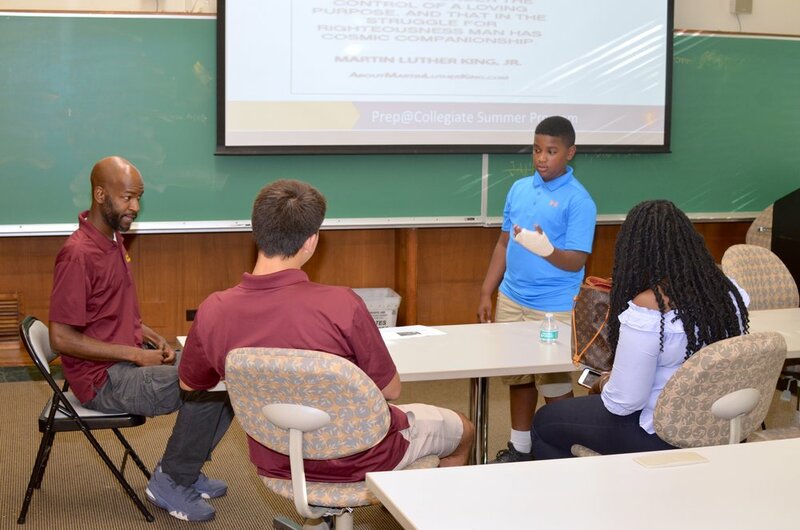 I learned about the Prep@Collegiate program through Mr. Jack Pannell, the founder of Baltimore Collegiate School for Boys, and have had a great experience working with both the boys and the team so far. I’m excited to keep it up and see them again next week. Go Amherst Crew! ...and leading his Crew through a discussion about one of BCSB’s Five Core Virtues. It’s hard to believe we’re just about 1/4 of the way through our summer together! We began our first full day in our new home by working together to decide what kind of community and culture we want to share. Boys worked in Crews to take Baltimore Collegiate School for Boys’ Five Core Virtues—Integrity, Wisdom, Courage, Compassion, and Resilience—and turn them into a set of clear, specific examples. Next, the boys prepared to translate these ideas into different media: one group prepared a skit; another worked out a dance number; a third rapped; the fourth put their thoughts in pictures; and the last—‘TwitterFingers’—drafted a series of tweets and replies, playing out a mock online debate. After presenting these to each other, the boys reassembled into their crews to bring it all together into the elements of rubric: an enumerated set of shared norms and expectations for behavior. At the end of the week, the partners will share their evaluations with each other; they’ll ask each other questions to better understand their peers’ assessments of them, and then they’ll gather with their Crew to reflect on the experience. Drawing on these insights, they’ll set goals for themselves—making commitments to challenge themselves to grow in the week ahead. ...and after lunch in the campus Dining Hall—where we taught the University the danger of an ‘All-You-Can-Eat’ policy—the Crews dove into the first of many rounds of fierce competition: a scavenger hunt, followed by Capture the Flag! Our first full day of classes! ...more on all of this—and much more—next week! Prep@Collegiate 2018 :: The Ship is Underway! 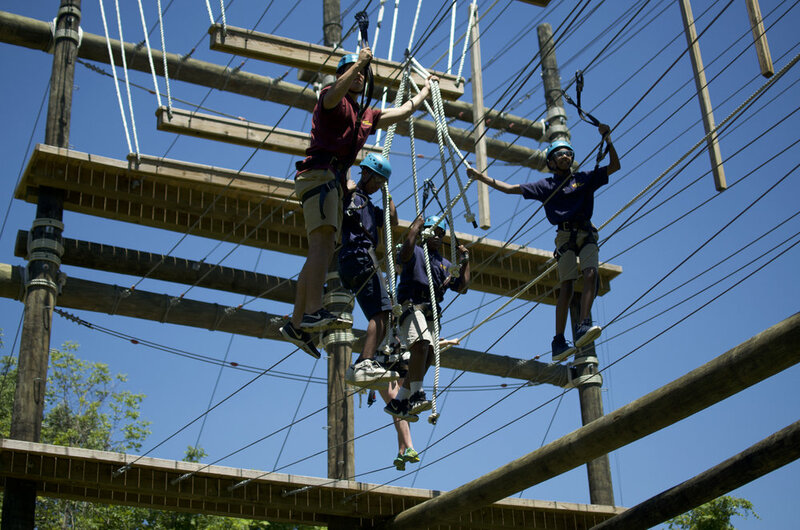 All of the anticipation and planning have led to this: our second year of top-notch, intensive summer enrichment programming for highly-motivated middle school boys. 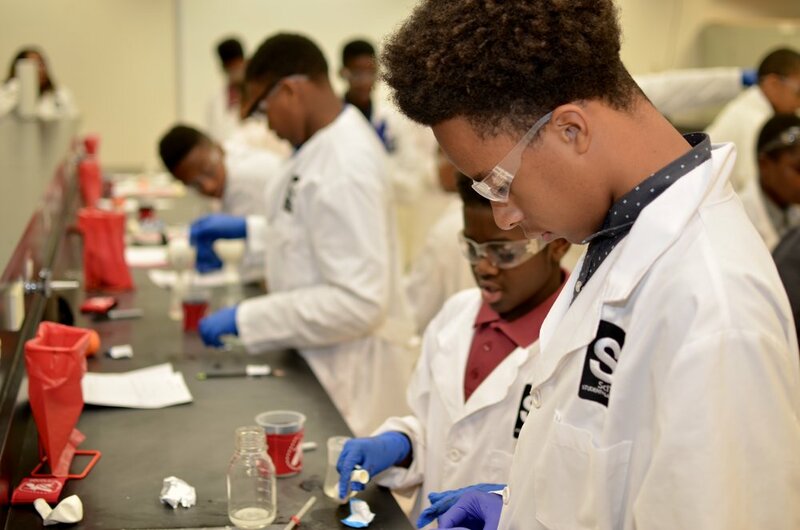 We have a stellar faculty & staff; rich co-curriculars & exciting field trips; and Baltimore's best & brightest students (50% more students than in our inaugural year, in fact!). ..before we moved on to a delicious Notre Dame University dinner, followed by a tour of the classrooms. Boys went with their Crew Leaders, while parents had the chance to speak with faculty about the summer ahead. At the end of the evening, the boys rejoined their families as newly-minted Prep@Collegiate 2018 Scholars! ...found us at the Baltimore Chesapeake Bay Outward Bound School, for a(nother) extraordinary day of experiential learning and team-building. Every single boy challenged himself--and exceeded his own expectations. In the process, we laid the foundation for the educational philosophy that guides our approach to work in--and outside--the classroom. ...oh, and: a scavenger hunt.